Product categories of Loader, we are specialized manufacturers from China, Wheel Loader, Backhoe Loader suppliers/factory, wholesale high-quality products of Mini Loader R & D and manufacturing, we have the perfect after-sales service and technical support. Look forward to your cooperation! Loader is a kind of widely used in highway, railway, building, water and electricity, ports, mining and other construction engineering conditions of construction machinery, it is mainly used to shovel sandstone, lime soil, coal and other material, can also be used for ore, hard soil, such as mild shovel dug. With different auxiliary working devices can also carry out the loading and unloading of soil, lifting and other materials such as lumber. On the road, especially in high grade highway construction, the loaders are used for the filling and loading of roadbed engineering, asphalt mixture and cement concrete materials. In addition, it can also carry out the soil, scrape the ground and other mechanical tasks. Because the loader has the advantages of fast operation speed, high efficiency, good maneuverability and light operation, it becomes one of the main machines for construction of earthwork in construction. Its main function is to loose material shovel and short distance transport operations. It is the fastest growing engineering machinery, production and sales and market demand one of the largest models. 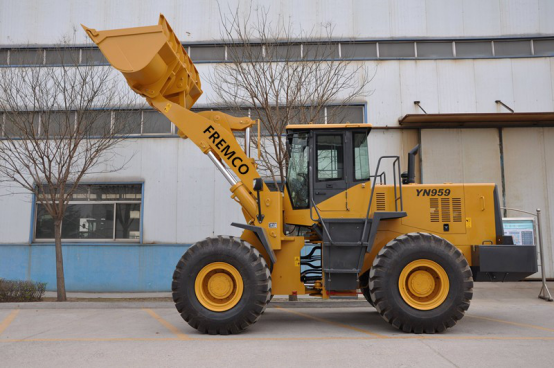 We usually see the most is the wheel loader, and it is relative to the Crawler Loader. Compared with the crawler type, it has good maneuverability, no damage to the road, easy to operate and so on.